Today's Image of Mars is of Phobos, the larger of the two Martian moons and, if the mission can be saved, the destination for Roscosmos' Phobos-Grunt. Phobos is 27 km at its longest point and orbits Mars at about 3000 miles above the surface in a little over 7 hours. Stickney Crater is on the bottom left of this image. It's uncertain how Phobos became a moon of Mars, or even where it came from. It may be a main-belt asteroid that was captured by Mars' gravity, or have formed during the early stages of the solar system. Another theory suggests that the ejecta from a large impact on Mars resulted in many moons, but that over the course of millions of years, those moons fell back to the surface. 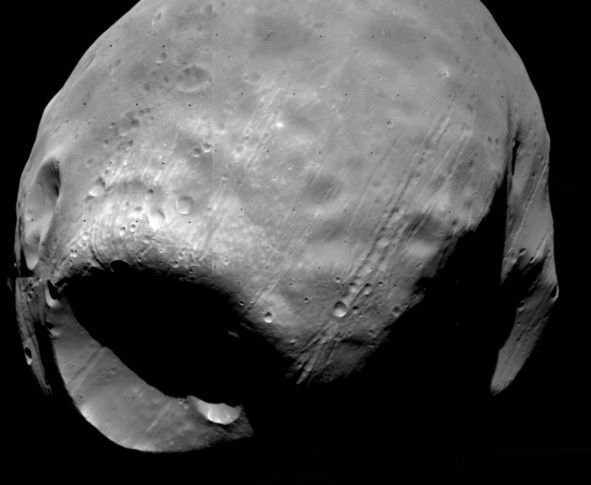 One of the missions of Phobos-Grunt is to determine the origin of Phobos. This image was taken by Viking 1 in 1977. Clicking on this image will take you to the Wikipedia page for Phobos where you can find a lot more information.